Thank you Blue Diamond Almonds for sponsoring this post! Plum Clafoutis. 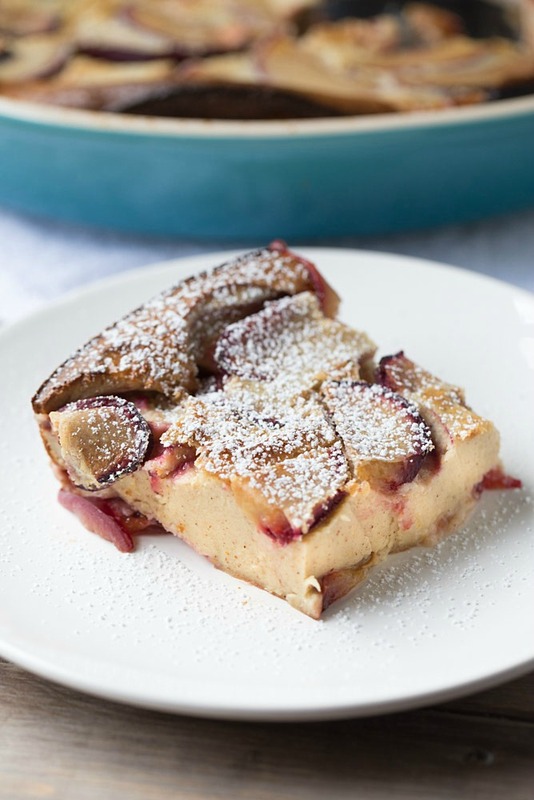 The classic French custard dessert dish get’s a makeover – this clafoutis is filled with fresh plums rather than cherries. Clafoutis. What is a clafoutis? A clafoutis is a French custard-like dessert dish, typically made with cherries. 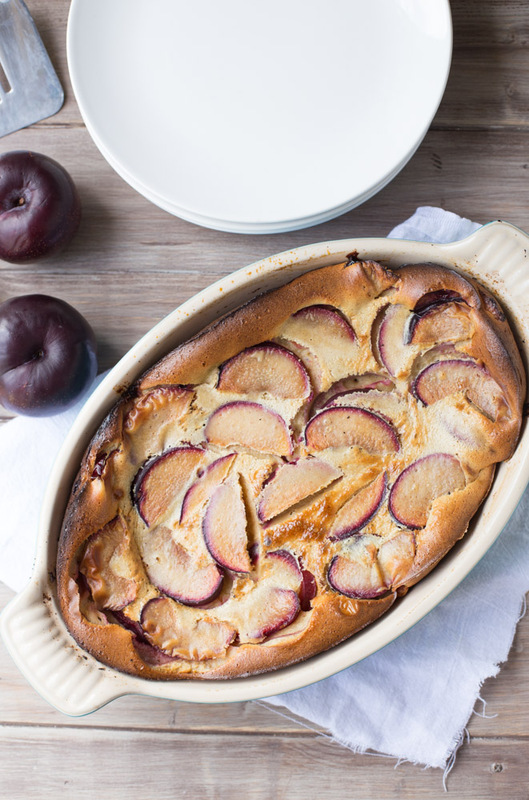 Fortunately for you, I had some fresh juicy plums sitting on my counter so I made this melt in your mouth Plum Clafoutis. 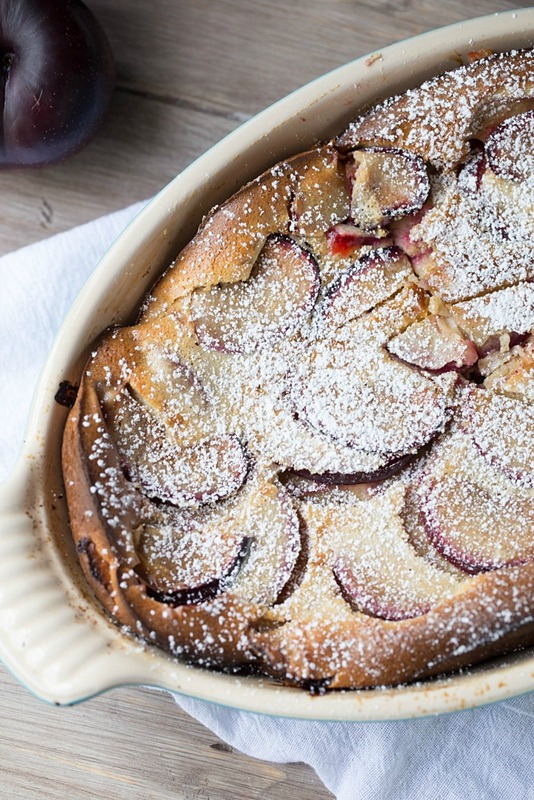 This plum clafoutis simple to make. Sliced plums are placed in a buttered casserole dish. The almonds are ground in a food processor. The batter is made in a blender. Blend, pour, bake. It’s that simple. 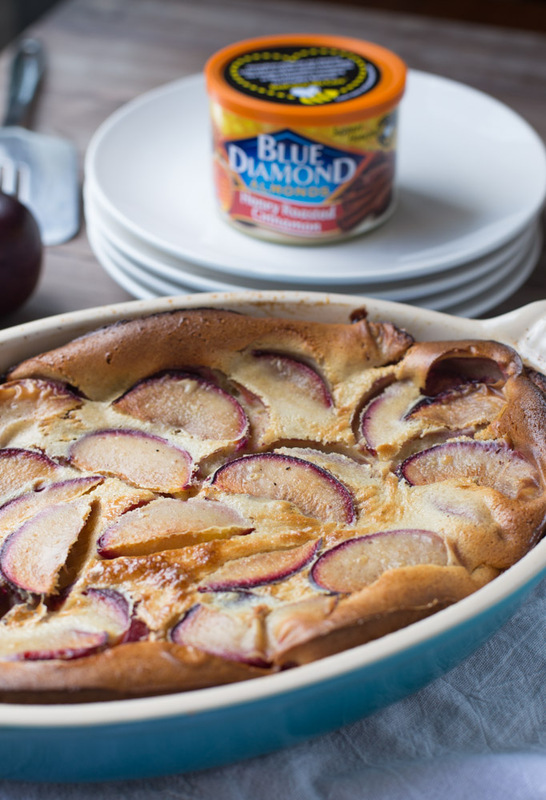 So, where do Blue Diamond Almonds fit into all of this talk of clafoutis? I used Blue Diamond Honey Roasted Cinnamon Almonds in the batter. BEST idea ever! Honey, cinnamon and almonds compliment plums so the combo NEEDED to happen. And it did. And then I darn near ate the entire thing myself. Last month I became a Blue Diamond Tastemaker. How sweet it that? Hello almonds and hello creating fun almond recipes for all of you! My first campaign as a Tastemaker is all about the Honey Dijon and Honey Roasted Cinnamon almonds, hence this Plum Clafoutis made with honey roasted cinnamon almonds. Not only are the almonds great for recipes, they’re great for snacking, too. Those honey dijon almonds, well I almost ate the entire container right after I opened them. I’ve been taking them to work to munch on when the 3pm snack cravings hit. You can bet your last dollar that the Blue Diamond almonds will be coming with us when we go on vacation next week. Coat the bottom of a 2 quart baking dish (I used an oval dish) with ½ tbsp butter. Dust with 1 tbsp powdered sugar. Place the plum slices in the bottom of the dish. Prepare the batter. Place the sugar, eggs, half and half, sherry, vanilla extract, orange zest and salt in a blender and blend until smooth. Add the flour and ground almonds and blend until smooth. Pour the mixture over the plums in the baking dish. Cool on a wire rack before serving. Once cooled, dust with powdered sugar. You will need 2-3 medium sized plums for this recipe. If you use smaller plums, you will need more. The goal is to completely cover the bottom of your baking dish with the plums. I needed three to cover the bottom of my baking dish. If your baking dish is shaped differently than the one I used (see pics) then you may need more or fewer plums. This post was sponsored and compensated for by Blue Diamond Almonds. All opinions, photos and adapted recipe are my own. I’ve been seeing plums pop up at the grocery store, I definitely need to buy some now! Beautiful recipe and I love how easy it is to pull together! Those big gorgeous plums are pulling me in! This is SUCH a stunning dessert, Julie! Perfect for spring and I have a feeling ice cream would go fabulously on top! That looks delicious, Julie! We are huge Blue Diamond almond fans over here – think I’ll have some now! Pinned! This is so pretty! I was JUST thinking how much I underutilize plums! Congrats on becoming a Blue Diamond Tastemaker! so fun!!! 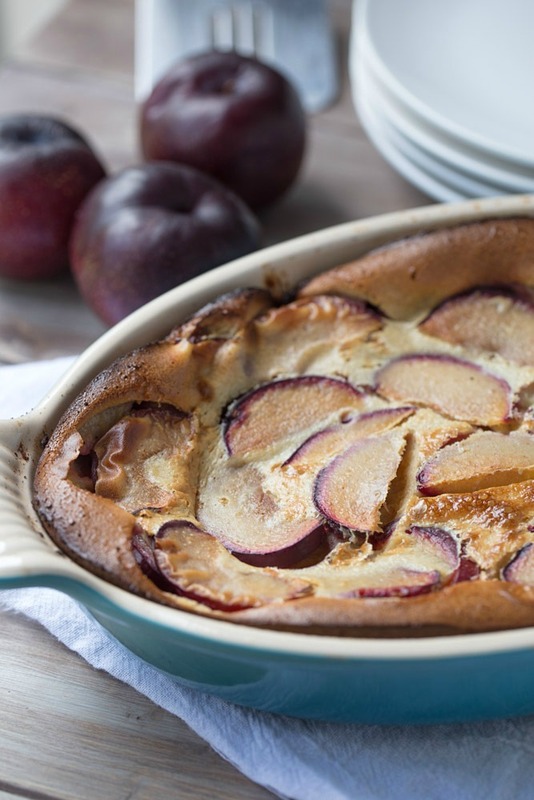 and I love this plum clafoutis. . so beautiful! I need to try the Blue Diamond Honey Cinnamon almonds, stat!! Thanks so much, Alice! You DO need to give the honey cinnamon a try! I had my friend try them today and she said she was going to go get some STAT! This looks awesome! I love Blue Diamond almond milk and they make these coconut almonds that are to DIE for :) Your clafoutis looks so delish! Oh I love the almond milk, especially unsweetened vanilla! My fav! Thanks so much for stopping by and for your sweet comment, too! Clafoutis is one of those things I always feel inspired to make when I see it on a blog, then promptly forget all about it! Maybe this year I’ll actually get around to making one. Pinning! You should definitely get around to making a calfoutis this year, Helen! I LOVE clafoutis! It’s like you are speaking to me here, Julie! I love that you’ve put plums in it too. Such a great dish that doesn’t get nearly enough attention. Totally pinning for later! Thanks so much for your sweet comment and the pin too, Justine! I usually forget about plums but I love them!! It’s the season again!! This looks amazing and adding some crunchy almonds to the batter is such a great idea!! Love love it! Thank you, Zaianb! Gotta scoop up some of those plums before they are gone. I am not seeing them as much anymore!